Take your deeded official right-of-way to reach the beach and shores of Baie Verte in a mere 200 meters (660 feet) from your property. Collecting shells, swimming, boating, saltwater fishing and long leisurely walks along the shore are favorite pastimes. Shallow water and huge sand bars at low tide are great for smaller tots. The land is fully surveyed and property borders are also marked. Electricity and telephone on the road. 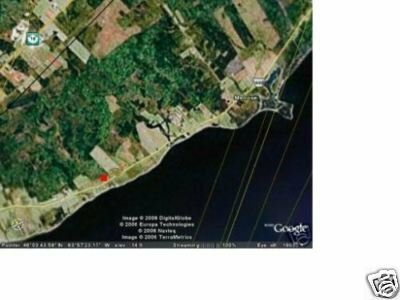 Lot #94-5 is a very nice level lot with view onto Baie Verte (Atlantic Ocean). Take a short ½ hour drive trip to Sackville, the lovely town with tree-lined streets and home of Mount Allison University. Here you'll also find historic homes, churches, restaurants, coffee shops, business center and much more. Location is comfortable, easy, and accessible year round. From Moncton you take highway #15 towards Port Elgin from here take the Trans-Canada #16 east 4.8km to Upper Cape Road, then further 9.5km to your property. The land is fully surveyed and property borders are also marked. Electricity and telephone on the road. Lot #94-5 is a very nice level lot with View onto Baie Verte Atlantic Ocean. Many visitors to the southeast shores discover during their vacation that this beach-rich paradise would be an ideal place to live and to own property. The sandy, warm, salt-water beaches and wind-swept contrast to the tide carved rock formations, rugged coast and invigorating waters of the Bay of Fundy. Located in the popular south eastern New Brunswick lies this nice property. It has 56.95 meters (186.84 feet) of road frontage on south shore road. WE ARE NOT REALTORS OR ASSOCIATED WITH ANY ONE . THIS IS A PRIVATE SALE.